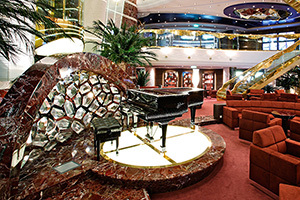 Launched in 2009, MSC’s 1,600-plus stateroom Splendida isn’t new. But, odds are, you haven’t heard of it: This line has only recently started to more heavily market in the U.S.
MSC bills itself as an Italian-style line, which refers to its rather over-the-top design (think: grand public spaces, marble flourishes, and fine artwork), party-hardy atmosphere, largely European clientele (expect announcements in several languages), old-school cruising style (set dining times, assigned tables), and Mediterranean-style cuisine. However, the low initial cost of the cruise — seven-day sailings start at a mere $500! — is balanced by the fact that just about everything costs extra onboard, from access to the hot tub in the spa to your morning coffee. While these lower-category cabins are geared to the value-conscious set, Splendida’s 71-cabin Yacht Club offers a luxe, all-inclusive experience. Concierge-levels aren’t a foreign concept, but MSC elevates the idea by creating an entirely different experience within the larger ship. Guests in the Yacht Club also have exclusive access to their own lounge, restaurant, and pool deck. Alcohol is included in their fare, along with special privileges, like priority reservations in the theater and dedicated spa treatment rooms. Yacht Club guests don’t have to suffer any of the indignities that passengers in the lower cabin categories face: They don’t have to fight for deck chairs, wait in buffet lines, or endure a long embarkation process. Instead, a butler picks these guests up dockside and they’re whisked away to a suite. Cabins start at a mere 172-square-feet. (But then, what did you think that $500 fare would buy you?) Compared with the grand décor in public spaces, their rather simple color palettes (green-on-brown in entry-level cabins) and severe styling (think: Holiday Inn, circa 1985) seem almost Spartan. 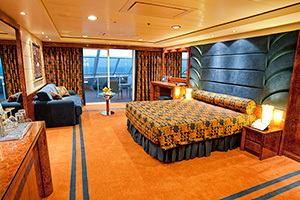 On the other hand, the all-suite Yacht Club staterooms (which start at 248 square-feet) offer more personality. With their bright colors and copious usage of suede (from couches and chairs to a wall panel), they’re charmingly over the top. Upgraded amenities include fine linens and ergonomic mattreses, a pillow menu, Nintendo Wii gaming systems, and mini-bars that are constantly refreshed with complimentary snacks and drinks. Despite the large size of the ship — which is similar to those of Carnival, Norwegian, and Royal Caribbean — Splendida has comparatively few onboard activities. But the offerings make more sense when you discover that MSC Splendida docks at a different Mediterranean port almost every day (most sailings only include one sea day), and passengers are busy exploring, say, Rome, Marseille, or Barcelona during the sunlight hours. Aurea Spa – Despite the Splendida’s Italian-influence, the ship’s large spa rather incongruously takes its cues from Asia, with bamboo-lined walls, teak lounge chairs, and treatments inspired by the Far East. Thanks to the exchange rate, he 20-minute show costs nearly $10 per person. 4-D Cinema –Equipped with seats that move in response to what’s on the screen, this theater takes 3-D glass-wearing viewers on a simulated ride through a mine or the cosmos. Formula 1 Simulator – The simulator helps guests experience what it’s like to live in the fast lane, thanks to realistic sound effects and a hydraulic system that reacts to the “driver’s” commands. You strap into a real car and “take off” on a simulated race track. 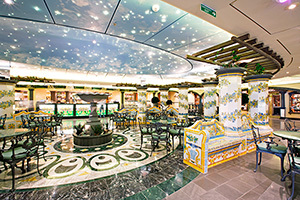 La Piazzetta's design mixes patterns ambitiously. There are few specialty restaurants: Bora Bora morphs into a pizzeria and kabab restaurant at night, and Santa Fe dishes out (unfortunately inauthentic) TexMex fare. La Piazzetta caters to sweet-lovers with an ice cream bar and chocolate and pastry shops; L’Espresso offers coffee. Tip: Look for La Reggia’s special menu: It’s some of the best food served onboard, and each night it includes dishes from a different region of Italy. MSC Splendida circles the Med, and guests can board in any of port and disembark at the same location eight days later. 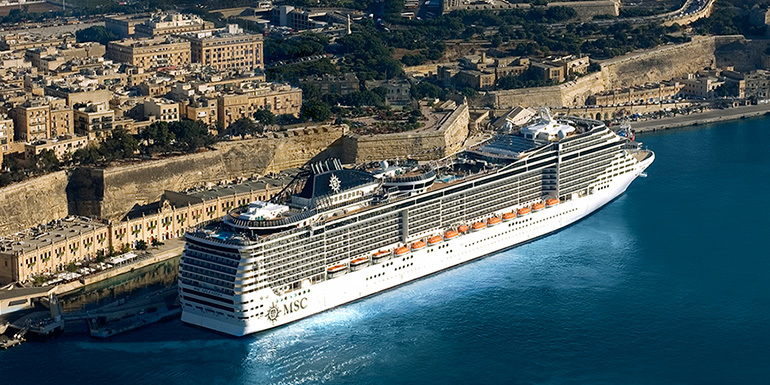 Have you cruised on MSC and, if so, what was your experience like?